In late September 1983 the Michigan Republican Party held a convention at the Grand Hotel on Mackinac Island. To those who have never been, Mackinac Island is in the strait between lower and upper Michigan which means its a fair piece from Detroit. What better way to get there than by train? So the Party arranged with the Detroit area commuter rail operation SEMTA for a special train to carry the delegates. In an aha moment, Julien Wolfe from SEMTA who was also a railfan had the idea of adding a car to the train and selling a trip to his fellow railfans. In spite of the fact that the train was political in nature, and that I would somehow be contributing to a cause I did not believe in, I cast aside all of my prejudices and bought a ticket for myself and my then-wife Nikki. So it was that on September 23, 1983 we found ourselves on the platform at Birmingham, Michigan waiting for an inbound train to Detroit (just so that we could say that we had ridden it) where we boarded the Elephant Express. The train was a seven(?) car train, including a baggage car, six cars of Republicans and a car of railfans (some of whom may also have been Republicans, but who were decidedly less well dressed.) 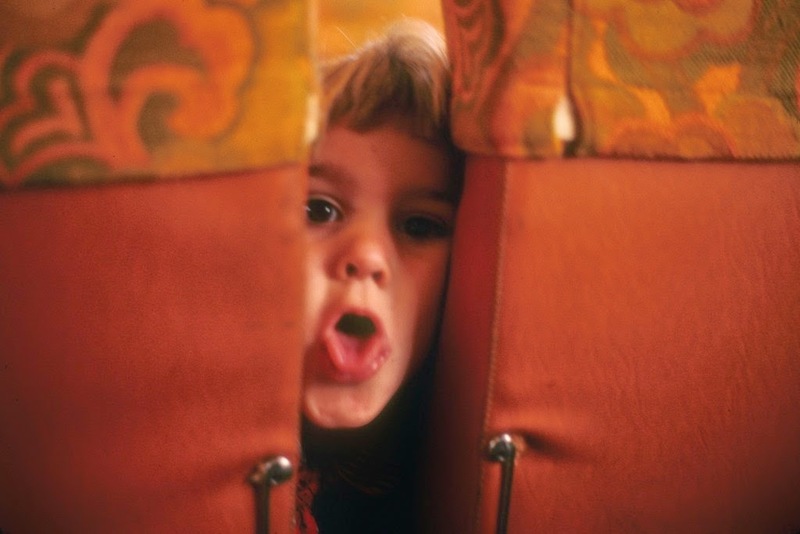 Also on board were a lot of people who either were, or were about to become friends. Among them were Dave and Carol Ingles and their daughter Suzy who was on her first big-time fan trip, Rick Moser (who I met for the first time that day), the late Tom Post (ditto), and I think Mike Schafer. 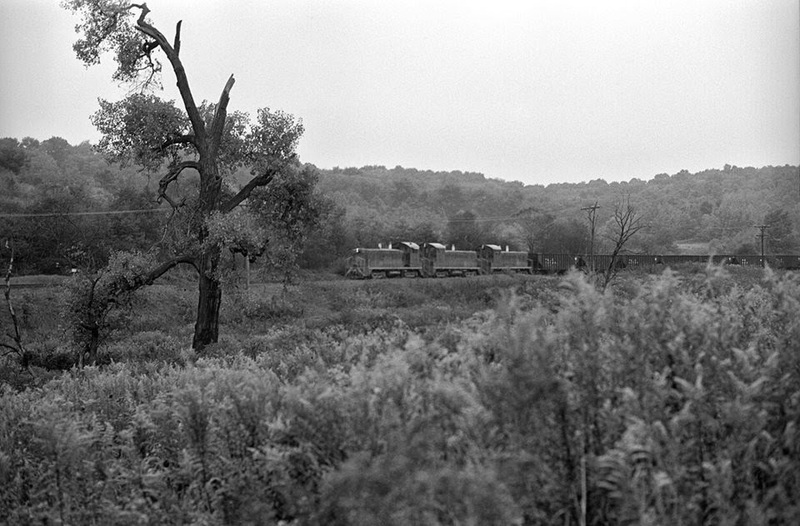 The route of the train that day was from Detroit to Durand to Saginaw, to Bay City on the Grand Trunk and Western, then on the Michigan Northern operated ex-NYC line through Gaylord and Cheboygan to Mackinaw City (where the Republicans got off), and then on the ex-PRR line to Petoskey (where the rest of us got off). Arrival was well into the evening but the local Holiday Inn was awaiting us. On September 24 we awoke to no power in our room at the Holiday Inn. Indeed the whole hotel was without power because of some local maintenance. Sometimes a problem has a ray of sunshine and I reminded my friends that Holiday Inn was running a "No Surprises" campaign and that we had definitely been surprised by the power outage. We all received one night free. 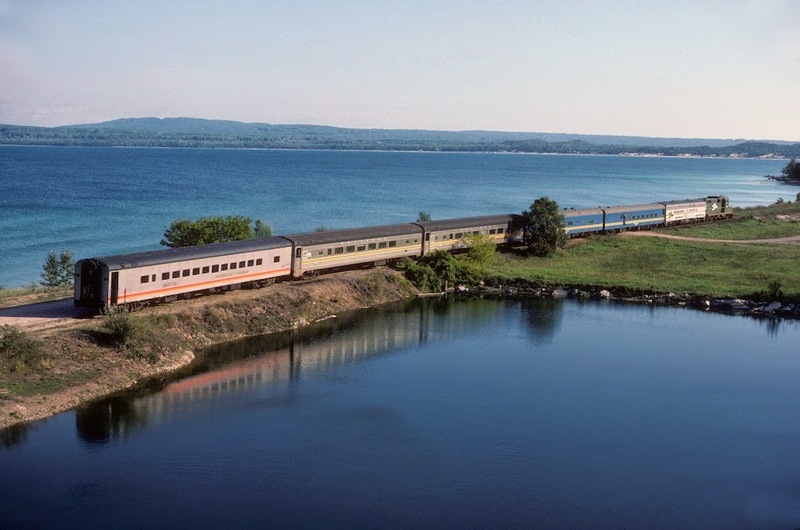 One of our party had driven the car down to meet us in Charlevoix and we chased the excursion train back to Petoskey. 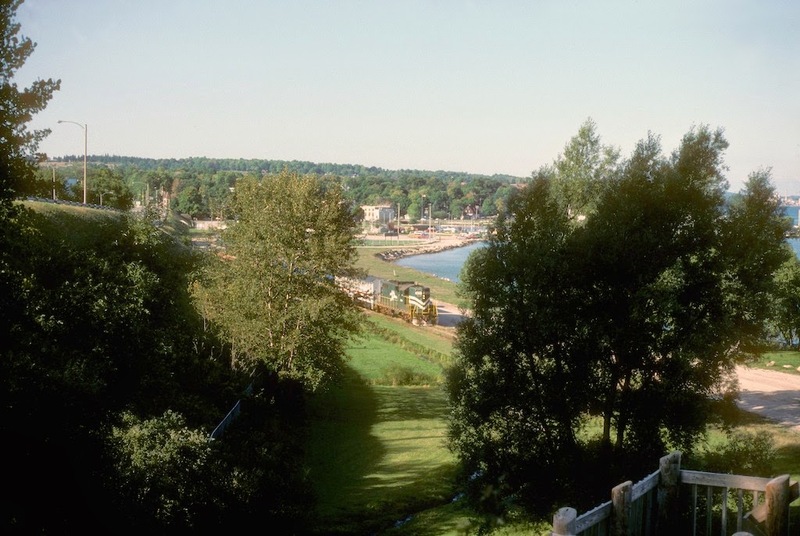 Upon return to Petoskey, Nikki and I decided that we wanted to spend the afternoon on Mackinac Island (I had been there when attending camp) but the rest weren't interested. In the first of many such situations to come, Rick offered to drive us to the ferry at Mackinaw City and then come back for us later. Nikki and I had a great time on the Island visiting places such as the Grand Hotel and strolling around the compact island. Rick picked us up as planned and we spent another night at the Holiday Inn before boarding a bus to take us to Mackinaw City where the train had been moved after we had left it in Petoskey. The train was scheduled to leave in the afternoon because of the convention schedule. While we were waiting Nikki and I took a walk around town and discovered the local delicacy the pastie (basically a Cornish pastie, but I did not know that then.) They were delicious and we brought a few back to the train to share. The train eventually left and ran through Petoskey and Cadillac to Reed City on the ex-PRR and from there back to Saginaw on the C&O where we rejoined the Grand Trunk and Western back to Birmingham. As the train approached Cadillac the organizers contacted a local McDonalds to provide needed dinner (it was already after dark). As the train left it was discovered that the McDonalds had not been paid...after a furious call from the manager. This was rectified when the train reached Reed City. Every time changed railroads there was a delay due to new crews etc. 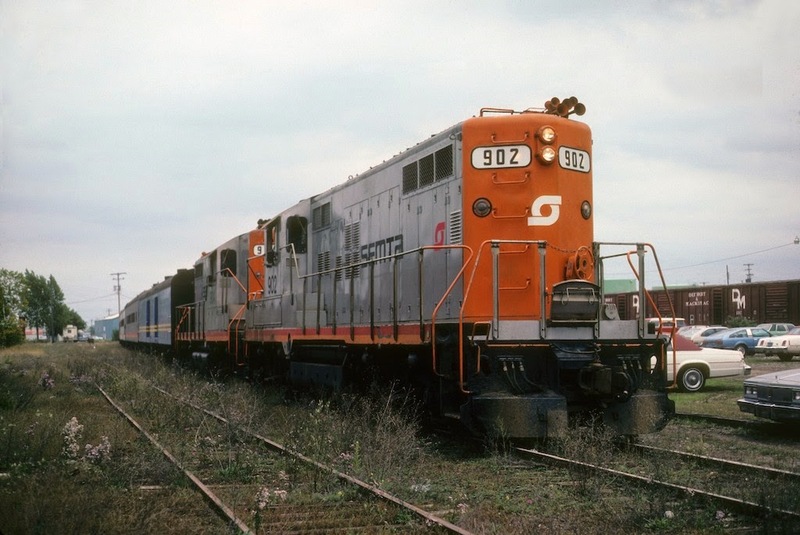 For instance after paying for the hamburgers our ex-GTW Geeps had to move some freight cars that were parked in our path on the interchange to the C&O before we could proceed. So it wasn't until 3:30am that the train arrived back in Birmingham. When we got there, of course, everyone was anxious to get off...but they detrained through a single vestibule so it took quite some time. Nikki and I drove to a nearby Sheraton where we spent a very short night because she had to be back in Pittsburgh for a class at 5pm. Never-the-less if I had the opportunity to do it again I'd jump at it. On July 19, 1989 I found myself in Atlantic City for the afternoon. I had arrived by train mid-morning and had a flight home to Pittsburgh in the early evening so I had some time to kill. Earlier in the 1970s and 1980s I had dabbled a bit with gambling, playing in a home poker game and, when living in California, some low stakes craps and blackjack in Las Vegas and Reno very occasionally. I was still playing poker at the time of this trip, but had not done anything else since the early 80s. Still blackjack and craps fascinated me. During my visits to Vegas I had picked up a copy of Thorp's Beat the Dealer and the Gambler's Book Club's The Rules of Craps in my attempt to beat the games...I just didn't play enough to become at all proficient. So I understood the basics of the games but not the nuances. I decided to risk $100 at $5 blackjack and $100 at $5 craps. If I remember correctly the nearest casino to the train station was Bally's so that's where I played. As I recalled I played blackjack for a pretty long time on my $100 buy-in using what I remembered of basic strategy and doubled my buy-in. Then I went to play craps and by the time I had to leave for the airport I had won about $70 beyond my $100 buy-in. In retrospect I was incredibly lucky. Had I not been, much of what follows might not have happened. Later that evening as I was flying home on a USAir BAC 111 (just before the airline retired the last of them) and I started musing that I would really like to learn blackjack better but that I didn't want to risk money while learning. So when I got home I started looking for software to help me learn to count cards. My search for training software didn't get very far. At the time all I could find a few games that did not have any real training functions. So I decided to roll my own. Also, since I had been wanting to learn to program the Macintosh I decided that would be the platform that I would use. At the same time I subscribed to Arnold Snyder's Blackjack Forum and picked up (and studied) some books on blackjack that were, shall we say, a bit more current than Beat the Dealer. I also became active in a usenet newsgroup alt.gambling (that eventually became rec.gambling) where there was an active discussion among folks on the Internet on many gambling topics. By late 1990 I had finished the first version of my program which I decided to call Blackjack Trainer. Blackjack Trainer let the user practice against various counting systems and it would alert when a mistake was made. It would drill the player on various hands. It also simulate the performance of various counts. I was impressed with it if I do say so myself. At some point I decided that it was a product worthy of sale to others but wanted a second opinion. So I sent a copy to Arnold Snyder for review. Not having a Mac he passed it on (with my permission) to Anthony Curtis of the Las Vegas Advisor who spent a fair amount of time with it and made some suggestions for improvement before it was ready for sale. Stanford Wong, of Pi Yee Press, pointed me to a good source of packaging. Arnold Snyder, the Gambler's Book Club and other outlets agreed to carry the program and all of a sudden I was a software publisher, albeit one without a name. I decided on a name (ConJelCo), a name which I will explain someday in another post. In January 1993 members of our home game in Pittsburgh decided to visit Las Vegas for a long weekend. When I posted a message on rec.gambling that we would be in town, it didn't take long for another group who was going to be in town around the same time to contact me about getting together for breakfast. One of the members of that group was Lee Jones a veteran of the Northern California cardrooms. While we were having breakfast Lee told me about a book that he was writing with Roy Hashimoto about how to beat the low-limit hold'em games that were so prevalent. He asked me if I'd be interested in publishing the book when it was finished. Having never published a book, and also having no idea what I was getting into I immediately said "yes" and we shook on it. The resulting book, Winning Low-Limit Hold'em, became the standard reference for beating the low-limit game and has sold incredibly well over the years. To both Lee's and my amazement it continues to sell even in the face of a shift of interest to the no-limit version of the game. Had any of the above steps not happened, I can pretty well guarantee that I would not be writing this today. Serendipity is, well, serendipitous. 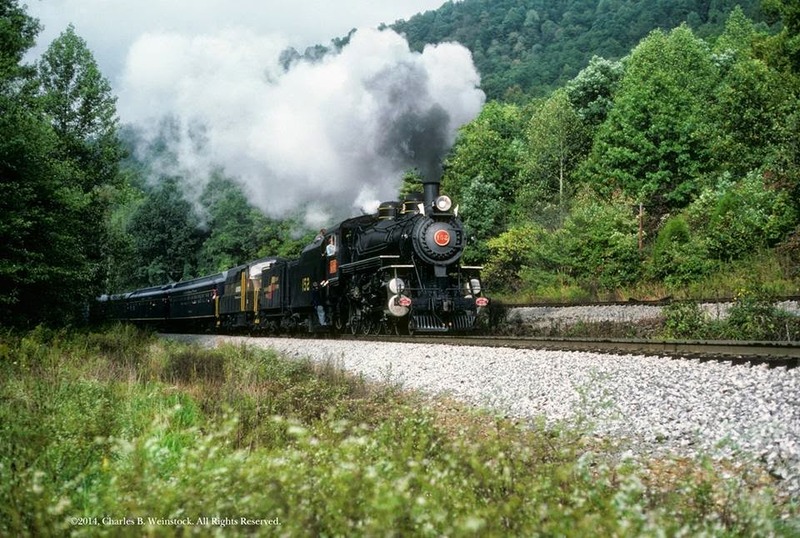 In October 1986, the Kentucky Railway Museum ran a multi-day excursion using their 4-6-2 Pacific ex-L&N 152 to the coal fields of Kentucky. 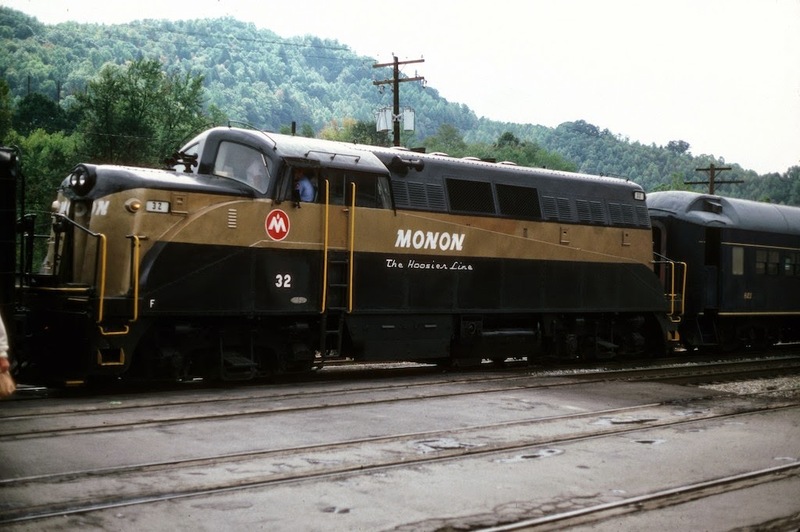 To assist they brought along their ex-Monon BL2 32. I met Rick and Phil Moser in Louisville on October 8, 1986 and the next morning we boarded the train for the first day of the trip. 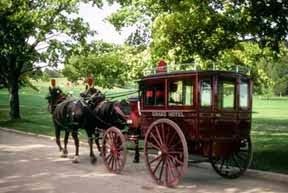 Rick and I were riding in the first class observation car. Phil was riding with some other friends in the coach portion of the train. On the first day the train traveled from Louisville (actually the KRMs old facility in the area) to Winchester and then down to Corbin (home of Col. Sanders of KFC fame.) We spent the night in an old, old motel near downtown Corbin. The second day was a relatively short day as we only traveled from Corbin to Harlan, KY (site of today's FX series Justified.) At Harlan we checked into a motel on the south side of town distinguished by the bulletproof glass that separated the motel check-in counter from the driveway. 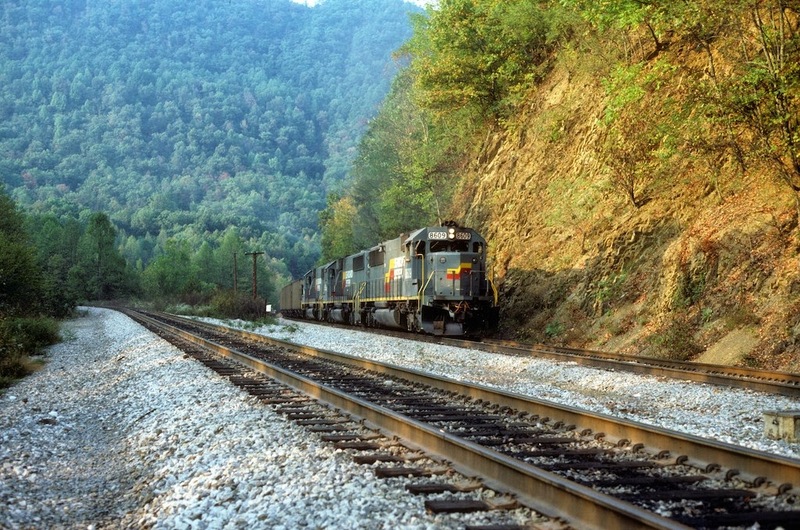 Rick had arranged with a local auto dealer to rent a car for part of the two-day stay in Harlan and we drove down to the famous Hagans switchback where we spent time taking pictures of some trains in the area. The third day of the trip was a roundtrip from Harlan to Appalachia, VA with a lunch in Appalachia. The fourth day found us heading back to Corbin where we spent another night in the same motel as last time. It was Phil's birthday and we eschewed the KFC shrine and instead took a cab to a nearby Cracker Barrel and treated him to dinner. The fifth and final day the train went from Corbin down to Jellico, TN where it was wyed and then back to Louisville via the now gone Lebanon branch. It was a terrific five days behind steam. 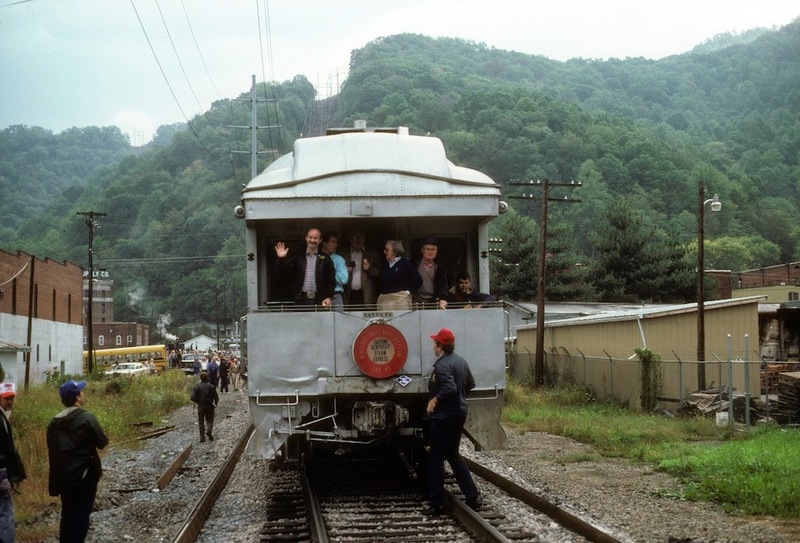 In May of 1975 I was still a grad student in Carnegie Mellon University's computer science department when I had a chance to ride the last passenger train over the Western Maryland from Connellsville, PA to near Hancock, MD. More about that later, but one of the great things about that trip is that I first met two people who were to become good friends as a result of it. Bill Metzger ("Map of the Month" in Trains Magazine) and Ivan Abrams had been chasing the train all day and we met when it stopped at Ohiopyle for a photo opportunity. I spent much of my next year in Pittsburgh (when I wasn't working on my Ph.D. thesis) with these guys taking pictures of trains all over the area. The above shot is one of my favorites taken near McDonald trestle. Much of the Montour is now a rail trail, and in fact this line became part of one, but a section of the it has been restored (alas without the tree) as the Westland Branch to serve a Marcellus Shale-based chemical plant. The Montour Trail Council owns the ROW outright and got a new parallel trail out of it plus a very nice annual endowment. The WLE operates the line now. 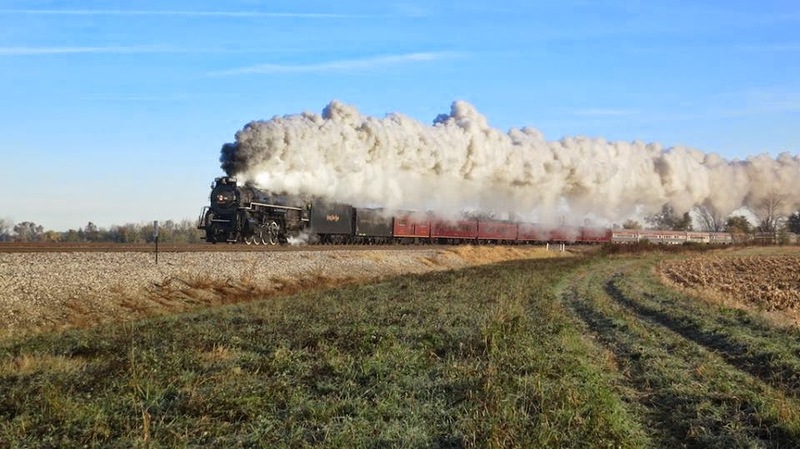 In late October, 2013 the Fort Wayne Railroad Historical Society ran a pair of excursions from Fort Wayne to Lafayette, Indiana and return pulled by 2-8-4 Nickel Plate 765. The trip was announced in August with tickets going on sale Labor Day weekend. It sold out within 36 hours but I was able to get tickets for myself and my friends Rick and Jane Moser, and Dave Ingles. As we left Fort Wayne I kept an eye out the dome window for a possible photo location for Sunday. I soon noted one and used MotionX GPS to mark it on a map on my iPad. I only had time for this one shot because I had to be back in the Pittsburgh area that afternoon for a college presentation with my (then) high school junior daughter. The result is the shot above. My friends headed back towards Chicago on Sunday and managed to get additional pictures of the train on the way. It was a fun, though short, weekend and a good chance to catch up with my friends. I created this blog to be a more (?) permanent record of some of the things I post on Facebook (for example). I have no real idea of what I will post here or how often I'll do so, but I thought it would be fun to start and see what develops. I'm going to start by populating the blog with some pictures, etc. that I have previously put on Facebook along with, perhaps, more complete descriptions.